Talk about making your own headlines! It’s true; the deputy business editor of the Post & Echo was caught in crossfire this weekend and – like the news trouper he is – tweeted what was happening to him, from the ambulance. 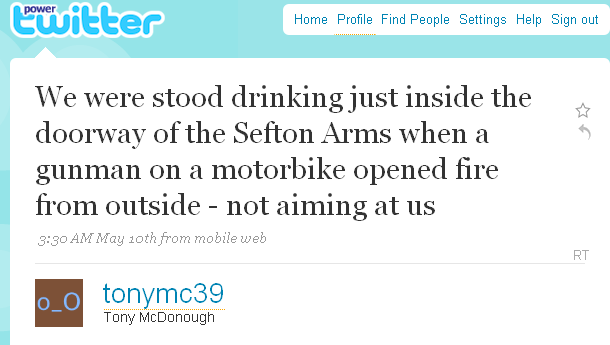 In a nutshell, (teetotal) Tony McDonough was unfortunate enough to be downing a diet Coke in his local Liverpool pub when armed bikers opened fire on the doorway in a “ride by” shooting. Some of the pellets hit him in the face, and he ended up needing an ambulance ride and hospital treatment. How dramatic is that? Tony isn’t the most active Twitter user so I asked him why he’d decided to tweet the drama, rather than texting or ringing friends. His final tweet describes his plan to turn in for the night, having had well enough excitement. If you want to read the news story (and he was today’s Echo splash) it’s here. This, for me, is one of the best examples of why Twitter can work for journalists. People are hardwired to want to share stories; at times of crisis we all want to tell someone, and I guess a number of people in the pub that night texted or phoned friends to share the news. Journalists want to get news out too, and they want to get it out fast and first to as wide an audience as possible (probably so we can then say “I was first”). Tony, as a Twitter user, knew he had a good way to reach multiple people and used it. He also is one of those in the office who really ‘gets’ liveblogging, and I suspect the two are linked – after all, liveblogging is all about urgency, communication and sharing information.